On May 5, 1862, General Ignacio Zaragoza and 4500 Mexican men took on 6500 French soldiers in what appeared to be a very lopsided affair in the Battle of Puebla. The Mexicans defeated the French, but lit a fire in the Europeans to send more men. All of this occurred while the United States was in the middle of the Civil War. In fact, one of the key reasons that the French wanted to quickly march in and take over Mexico was they wanted to aid the Confederate States in the Civil War. Not many Americans spent May 5, 1862 drinking Tequila and having Jalapeno eating contests. As I mentioned before, I missed the new music Tuesday post, so I will take you from The Battle of Puebla Day to Guacamole, which I’m sure you’re aware is made with avocados. An easy segue to Pearl Jam’s self titled album that was released on Tuesday. Anyone who knows me, knows Pearl Jam is one of my favorite bands. I’ve mentioned Ten before in the album cover series. In 1994, Pearl Jam broadcast a concert on the radio. Thanks to Erik, I had a copy of this. I listened to that show so much that I Rattle-and-Hummed it by memorizing every word. Recently I found that very show in MP3 and it brought back all of the excitement of waiting for Vitalogy to be released. 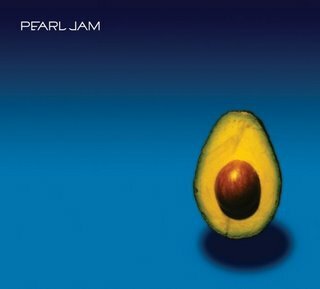 It’s been just over 12 years since that concert was broadcast and Pearl Jam are now on their 8th studio album. Before Dave Letterman talked every night about having Oprah on his show, he would plead through his cameras for Pearl Jam to come on the show. Well Oprah has been on the show and last night, once again Pearl Jam graced the stage of the Ed Sullivan Theater. After the show was done taping, the band played several songs from the new album as well as a trip back in time. They recorded the show and posted it on the Late Show web site. There are more than two things that make Pearl Jam amazing, but in watching/listening to Pearl Jam, it’s clear that my favorite two things about them are the relationship between Mike McCreedy and Stone Gossard’s guitars and Eddie Vedder using his voices as an instrument; more than what’s coming out of his mouth, it’s how it’s interacting with the music. So pick up the new album, and check out the other titles that came out this week.